SUBHEAD: Being indigenous isn't really so bad, considering the alternative. It's just means being in a community in a place in the world. Image above: Ceremony of the lighting of the Indigenous Sacred Fire in Cuiaba November 8, 2013. 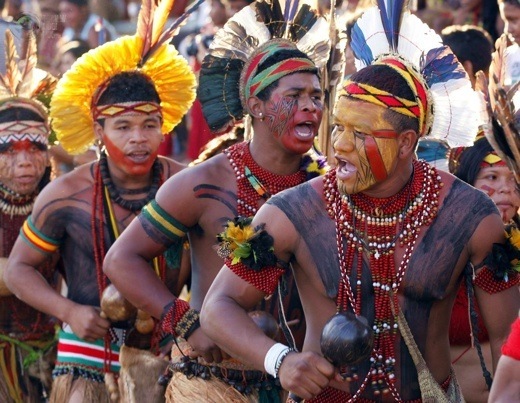 Forty-eight Brazilian tribes presented their cultural rituals and competed in traditional sports such as archery, running with logs and canoeing during the XII Games of Indigenous People. There are several movers and shakers in the world that I have had respect for who have come to realize the desperate situation that modern mankind faces. This group senses that Peak Energy and Climate Change (due to the burning of the afore mentioned energy) are conspiring to put Modern Civilization off the road and in the ditch. James Hansen - NASA atmospheric physicist; climatologist; Climate Change activist. James Lovelock - proponent of the Gaia Hypotheses; author "The Vanishing Face of Gaia". Steven Hawking - cosmologist of Black Holes; author of "A Brief History of Time". Stewart Brand - founder of the Whole Earth Catalog and The Long Now Foundation. Bill Gates - software engineer, founder of Microsoft, philanthropist, author of "The Road Ahead". These guys perceive, quite rightly, that there aren't many ways to stay on the road and keep the wheels turning. The universities, the industries, the technology hubs, medical research facilities, the information/entertainment networks all require a level of refinement and continuous clean energy that does not appear possible with our current means. This group has concluded that there is no way forward but a crash course of building nuclear power plants to support the power grid and information systems and organizations that sustain Modern Civilization throughout the world. This would require the construction of several hundred nuclear power plants to replace virtually all the oil, coal and natural gas power generating stations in the world. As they look to the sun Lockheed is working to develop a source of infinite energy... Suuuure. A revolution in nuclear power could slash costs of energy below cost of coal... Suuuure. Safe as a nuclear sub. These units be installed anywhere to supply needed power... Suuuure. The facts are that the infrastructure to support a nuclear powered future does not exist and the resources to create and sustain that infrastructure do not exist. As one example: We simply will not be able to repair and maintain the US Interstate Highway System necessary to provide the support for building, operating, and decommissioning of those nuclear power plants we want to build. Just need for concrete, steel, and paving that is required for the bridges, over/under passes, culverts and roadways is monumental. As it is, our highway systems are crumbling and we do not seem to have the ability to keep up with its decay. Just imagine the lack of highway repair if we get to the point that interstate trucking is an unprofitable undertaking due to the cost of diesel fuel. Although they won't yet admit it, Japan has demonstrated that nuclear power is a dead-end. The continuing massive release of radioactive material into the Pacific Ocean and the contamination of a large section of the middle third of Honshu Island (including greater Tokyo) is a permanent testament to the folly of nuclear power. Japan's economy has been destroyed. The fact is hat they cannot afford to keep the Toyota, Nissan, Hitachi, and Mistubishi industries running on oil and they do not dare restart their 50 nuclear plants. This will be much clearer when the thyroid cancers emerge and other debilitating consequences of the Fukushima nuclear plant failure can no longer be hidden. Turning to Japan....That sore beset kingdom is suffering all the blowback of modern times at once: the Godzilla syndrome up in Fukushima; a demographic collapse; an imminent bond crisis; the collapse of export market partners; and a long, agonizing death spiral of its banks. I stick by a prediction I tendered back in March, after the deadly tsunami: Japan will decisively opt for a return to pre-industrial civilization. Why not? The rest of the world will be dragged kicking and screaming to the same place. Let Japan get there first and enjoy the advantage of the early adapter - back to an economy of local, hand-made stuff, rigid social hierarchy, folkloric hijinks in whispering bamboo groves, silk robes, and frequent time outs for the tea ceremony. I wholeheartedly agree with Kunstler on this point and see that there is really no alternative to climbing down off our high horse and dealing with reality. Worldwide economic collapse due loss of non-renewable resources - Peak Everything. Wars fought with WMDs for diminishing resources - especially water, food and fuel. Loss of knowledge and technological skill resulting from failure of information systems. What will be needed as a base to work from is being able to conduct our lives with the energy and renewable resources immediately around us. That means sun, water, animals, plants and soil where we live. For some places and peoples that may mean being hunter/gatherers with no fixed settlements; for others that may mean small rural gardening communities. The point is that the hunters and gardeners will be the rule not the exception. We will be indigenous, finally again. This does not mean we will have no education or culture. But the subject matter and art forms however will be your own responsibility. There will be repositories of knowledge - likely in the country monastery or manor library. There may even be villages with a school and the occasional town with a university, but they will be the exception not the rule. Being indigenous isn't really so bad, considering the alternative. It's just means being in a community in a place in the world... and not somewhere else. It also means embracing that arrangement. Forget the airports, the strip malls, the office cubicle and the cul-de-sac. You won't have to go there anymore. In fact you won't be able to. But you will have to get together to make dinner then make some music. Go Nuclear or Go Native. There won't be much in between. World War III: It's here!